Silicone Bonded Mica Tube combines high temperature resistance with good electrical insulation properties. These insulating tubes offer excellent resistance to a wide range of chemicals, low thermal conductivity and are used for forming a range of insulating components; including bolt insulation, high temperature stand-off insulators, insulating bushings, spacers and sealing rings. We offers our Silicone Bonded Mica Tube in a range of different sizes and can also utilise our extensive fabrication facilities to produce the exact component you require. We are suppliers of Silicon Bonded Mica Washers are made from fine quality Silicon Bonded Mica Sheet. Available at different custom sizes. Silicon Bonded Mica Rigid Mica Laminate is made by combining uncalcined muscovite or phlogopite mica-paper with an inorganic silicone-resin binder under specific heat and pressure. Since the binder plays a critical role in the overall product performance, the best commercially-available resin,with as much as 82% solid silicone content,is imported from Germany for excellent results. Muscovite mica paper-based material can withstand temperatures up to 600°C whereas, phlogopite mica paper- based material can withstand high temperatures up to 800°C. The product is IEC 60371 -3-3 compliant. A choice of epoxy resin is also available as a binder. Ruby Mica Epoxy Rigid Mica Laminates have higher rigidity, highly-uniform surface profile and weatherproof properties when fully cured. Heating-element supports, winding-cards and cover-plate insulation in domestic appliances and industrial-heating elements. Its superior chemical-resistance makes it an ideal battery-cell separator. Highly temperature-resistant mica machined parts for complete Ferro alloys submerged arc furnace and induction furnace insulation. Dynamic breaking resistors in railways and plate-insulation in heated presses. 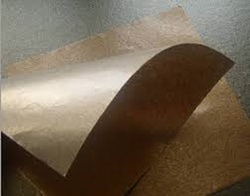 Flexible composite mica roll is made by using high quality muscovite, phlogopite or synthetic mica paper with one side or both sides backing with different material as per requirement and needs. The Glass cloth, Ceramic felt, and Nomex are mainly used as backing material. It contains both mica and ceram to own good insulation and isolation functions. The silicon Binding Agent provide high strength and H class insulation which enables to use this product in broad range of products. The composite mica rolls are laminated in two layers and also in multilayer, the layering allows us to maintain the thickness and gasket mica sheet exhibits low shrinkage, good aseismatic property, Excellent thermal resistance, Good corrosive and wearing resistance and also with no asbestos or noxious contents. Flexible composite Mica roll are widely used for aseismatic and thermal insulation of electrical apparatus, heat insulation, and even as the necessary fireproof layers in industrial furnaces and metallurgy. Mica are mainly used for thermal as well as electrical insulation purpose. We are offering an exclusive range of mica which is available as per the requirements of the clients and is offered at optimum prices. These are quality tested at several parameters to assure their standards. 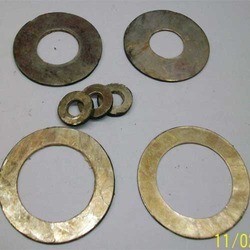 Description: Mica Washers are used for thermal & electrical insulation. This product have low thermal expansion, low thermal conductivity & withstand very high dielectric strength & high temperature and also have good mechanical strength before and after machining. Capacity: Withstand temperature up to 950° C, BDV > 20 KV/ mm. Application: Wherever insulation of high temperature & high dielectric strength is required.